Hello friends! 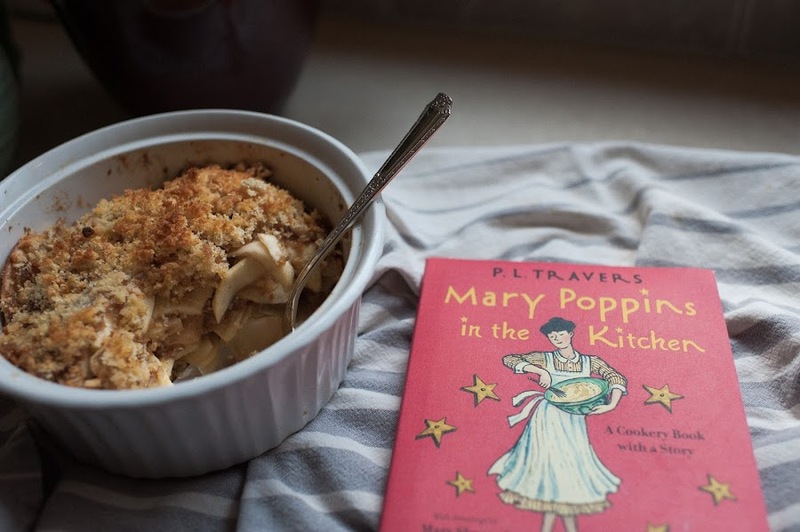 I've got the easiest sweet treat (it's fairly easy - the only hard part is apple peeling) and it's from a DARLING book called 'Mary Poppins in the Kitchen' and I'll show it off more completely in a different post. But I made one of the recipes and it was so nice! 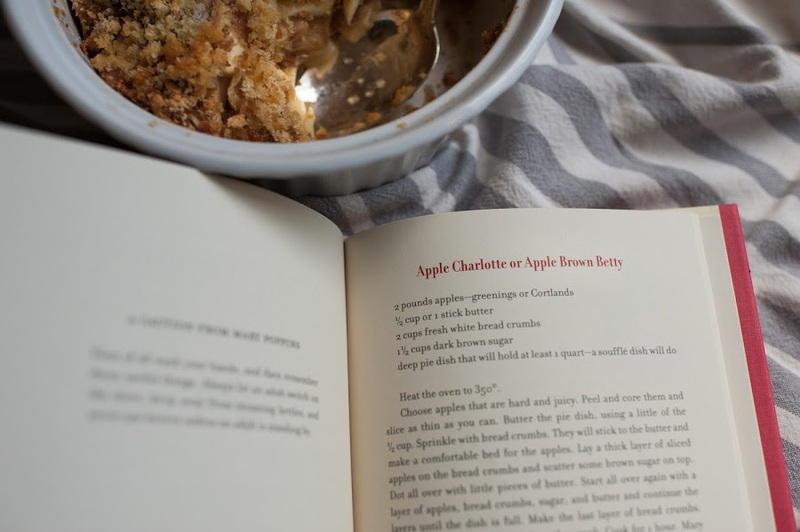 In the book, it was called 'Apple Brown Betty or Apple Charlotte'. 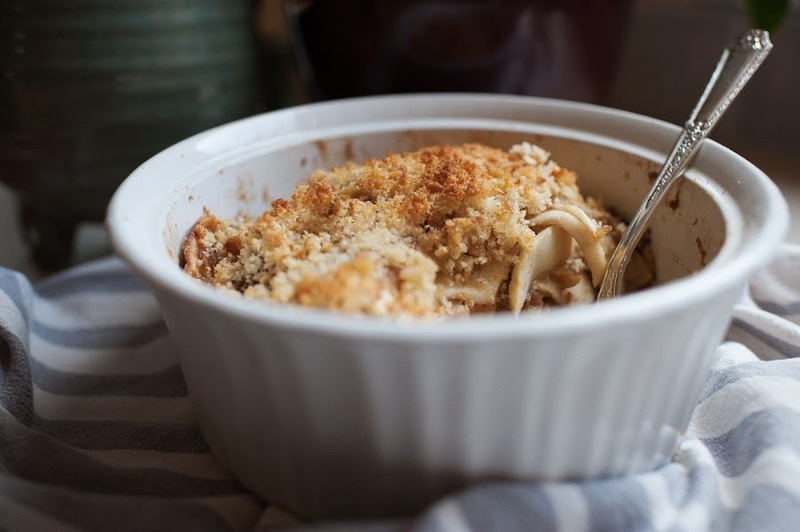 I can tell you that I'm fairly certain that this is in fact apple brown betty, which is a dessert that calls for layering apples with sweetened bread crumbs, as opposed to apple charlotte, which I believe is a molded dessert consisting of apples baked in a sort of soft bready crust affair. I might be wrong, so if you are really up on your Betty vs. Charlotte lore, please be kind and tell me so that I can put my ignorance behind me. I can't fully express how adorable this book is ~ apparently there are lots and lots of food scenes and food prep scenes and food eating scenes in the various Mary Poppins stories. So much so that there were enough to collect many of the kitchen and food parts of the books and weave them together in a collection with full color illustrations by Mary Shepard. (fun fact: i've never actually read all the way through the original Mary Poppins! are you shocked?) After the snippets of Mary Poppins food stories, there is a set of the most delightful recipes, and I'm looking forward to working our way through them. Roast Chicken and Bread Sauce. Zodiac Cake (a sort of chocolate nut cake decorated with silver stars). Yorkshire Pudding. Lemon souffle. Lancashire Hot Pot! I can't wait to try them all. I was so surprised by how much I liked the apple brown betty. I'm going with betty rather than charlotte. 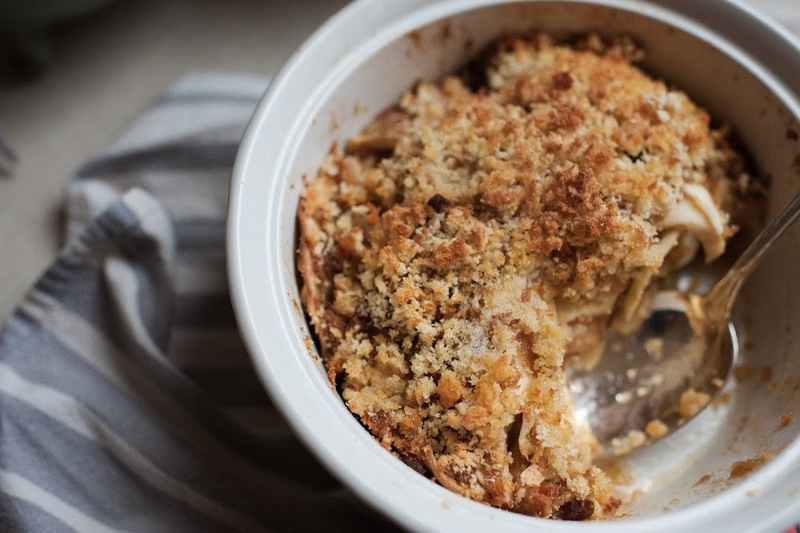 I wasn't too hopeful about a bunch of apples with breadcrumbs and brown sugar, but the whole thing was so...light. 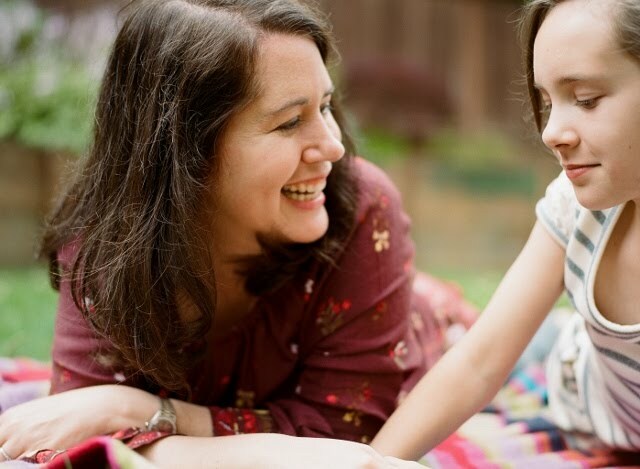 Pie is my favorite thing in the whole world, but sometimes it can be HEAVY. This was not heavy, and despite the amount of butter and brown sugar called for, it tasted....wholesome. It was like sweetened, crunchy-fied, buttery applesauce. It almost tasted like apple PUDDING. Not pudding like the British use it (meaning a dessert) but pudding as in American pudding, creamy and airy. We ate the whole thing up in about a day and a half, and I wish I could impress upon you how old fashioned and tea time-ish it tastes. The next time I make it - cream is going to be drizzled on top. And eaten for breakfast. I'm so sorry for what I'm about to say but....YOLO. "Preheat oven to 350 degrees. Peek and core apples as thin as you can. Butter the pie dish, using a little of the 1/2 cup butter. Sprinkle with some bread crumbs. They will stick to the butter and make a comfortable bed for the apples. 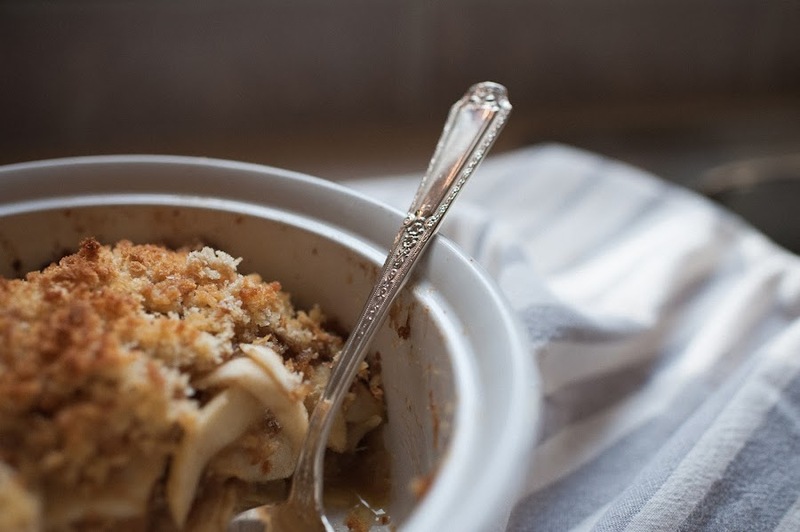 Lay a thick layer of sliced apples on the bread crumbs and scatter some brown sugar on top. Dot all over with little pieces of butter. Start all over again with a layer of apples, bread crumbs, sugar, and butter and continue the layers until the dish is full. Make the last layer of bread crumbs. Pile it high. The apples shrink as they cook. Bake for 1 hour. Mary Poppins serves this pudding lukewarm with whipped cream." Try this out my lovelies! Despite the fall time seeming nature of this dessert, it's good any season. The crunchy bits of buttery, brown sugared breadcrumbs are truly wonderful. 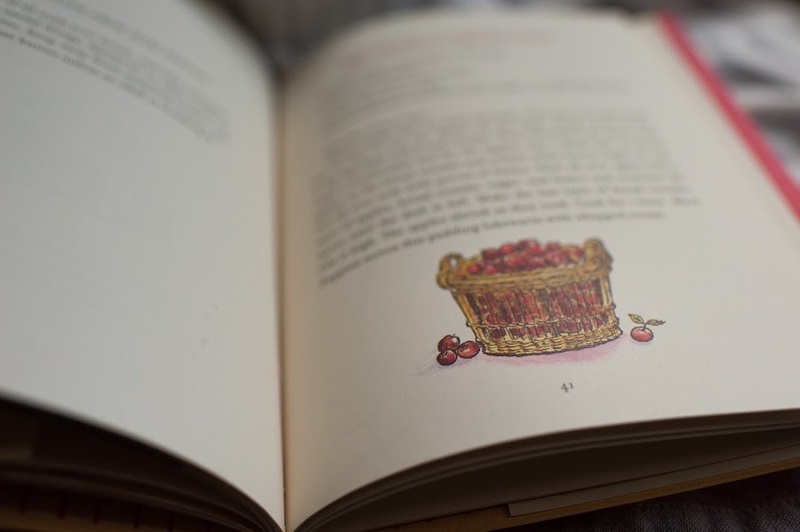 Oh -- I recently mentioned this blog before, but I'm totally obsessed with every new post from The Little Library Cafe - if you love food and food references in books, or if you read books and imagine what kinds of foods should be in them, you have to see this blog. This looks amazing! And I am fascinated by the literary cooking website! It's so good!! And oh i love that site so much - she has a cookbook coming -- i'll be getting that one, assuming it's not all in UK measuring units! !